This stunning rustic beach wedding took place in The Turks & Caicos in The Caribbean and was captured by Segerius-Bruce Photography. Check out all the photos of the decor and design elements below for more rustic beach wedding ideas. 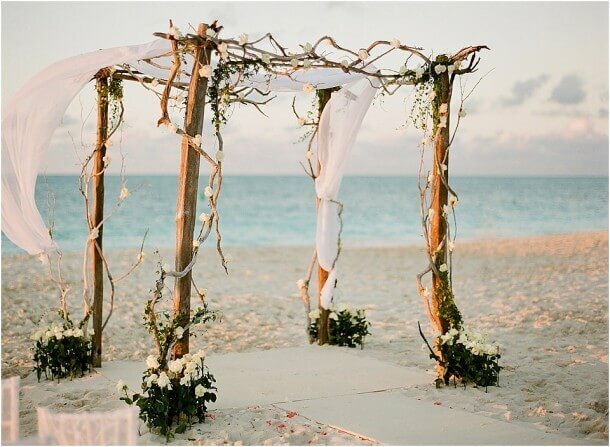 The bride and groom exchanged their wedding vows seaside, beneath this stunning rustic canopy crafted from driftwood and twigs and billowing white tulle. Ivory roses wound their way up the sides of the canopy, and at the base of each of the canopy legs, a dozen long stemmed roses were inserted into the silky Caribbean sand. The aisle for the wedding ceremony was defined by metal hooks, inserted into the sand. Pomanders (ball bouquets) of ivory white roses dangled from the hooks. White chairs, covered with sheer white netting chair covers were positioned facing the canopy, with a stunning view of the Caribbean sea as a backdrop for the wedding ceremony. How breathtaking is that? Following the ceremony, an elegant reception took place outdoors so guests could enjoy the Caribbean breeze and fresh sea side air, beneath a canopy of white netting. With a floor constructed of wooden planks positioned right over the sandy beach, the rustic atmosphere continued through the otherwise elegant affair. All of the design elements were coordinated so beautifully to create a rustic beach wedding theme. Simple sea shells served as pretty napkin holders, tied to the napkins with natural raffia string and charger plates made of woven natural grasses were the perfect compliment to the place settings to once again, enhance the rustic ambiance. 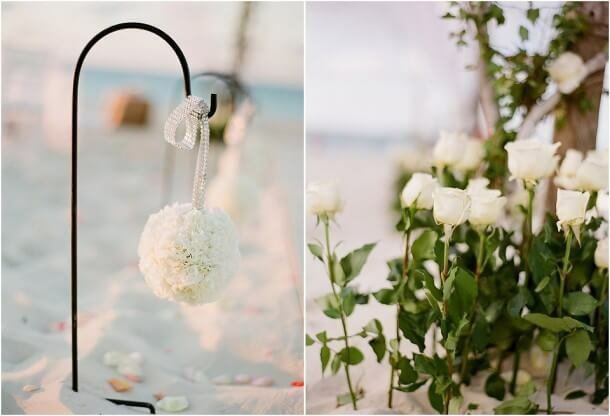 Centerpieces of pink and white peonies bring forth the elegant simplicity of this elegant but rustic beach wedding. Rocks lined the bottom of square glass vases into which cut peony stems were very simply arranged. The entire event reflected simple elegance, but simple is not always inexpensive! A lot of couples assume that having a wedding outdoors will cut costs, but when all is said and done, the expense of constructing flooring in the great outdoors (a practical necessity) as well as canopies and tents drives costs up higher than a lot of people anticipate. Don’t forget that porta potties will need to be rented, and that adds an additional line item to the wedding budget. The floral arrangements and decorations for this wedding were not low budget. Depending on the details, it is not uncommon for an out door wedding to actually exceed the cost of having a wedding of the same size indoors. So before you let these stunning photos woo you into the idea of a beach side wedding, do bare in mind that while it is breathtakingly beautiful, it is not necessarily a budget-savvy alternative.